BABA looks to unite local Asian businesses in the county with one voice to represent them on issues of local and national importance such as legislation and government relations. BABA is here to provide a voice for the Asian business community and to provide them with information and advice on anything of interest – from starting a business through to selling goods or services. 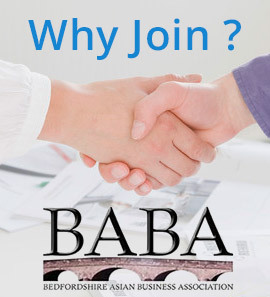 Membership of BABA is open to all whether you are Asian or not and comes with benefits such as free training and seminars on issues of interest such as banking, accountancy, local planning, fire ans safety and of course, a number of networking opportunities. BABA wants to go one step further and seeks to partner with other organisations both in the UK and abroad for the benefit of its members. BABA also intends to bring together big business with local organisations – networking is incredibly important to BABA in helping members to expand their commercial base. To consistently support members and the broader business community by responding quickly to issues of concern and representing them effectively at all times. To manage and bring together different business segments and communities to offer a strong local voice for the Asian business community. To work with and communicate to all levels of Government the interests and concerns of the Asian business community. To effectively represent its members at all levels within the business community by actively driving forward relevant business issues and seeking clarification of issues which may, do or will affect its members. To actively seek partnerships with other organisations which can assist in the attainment of BABA\'s mission. To communicate and inform members of issues and initiatives which can assist in the better management of their operations. To facilitate opportunities where effective networking can occur for its members.